Gabe Newell says Electronic Arts is welcome to put Origin on SteamOS if it wants to. 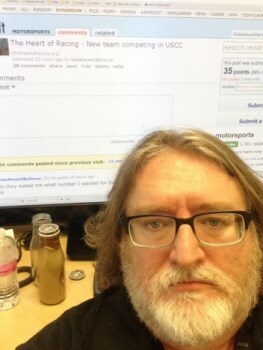 Gabe Newell spent some time on Reddit last night, as you may have heard, and while the original intent was to talk about his involvement in The Heart of Racing event the conversation naturally took a turn toward gaming. That led one Reddit user to ask why Valve would make Steam Machines "so proprietary" when it's spoken out against proprietary platforms in the past. "What part is proprietary? We're trying to make it as open as possible," Newell responded. "If EA wants to put Origin on it, that would be fine, etc... (trying to pick an example of something that people think we would prohibit)." You may recall that Valve and Electronic Arts got into a beef a few years back over EA's decision to release its games exclusively on Origin; the following year, Origin chief David DeMartini accused Valve of "cheapening" intellectual property with frequent, deeply-discounted Steam sales. Newell did say in 2011 that it was up to Valve to convince EA of the benefits of being on Steam but by all appearances, relations between the two have remained frosty since then. It's not likely that EA is going to trip over itself whipping up a SteamOS-compatible Origin client based solely on an offhanded-remark on Reddit, but it could be the first step toward a thaw - and if Steam Machines are a hit, EA is going to want Origin on them.